late at night, about 10:30pm on april 21, 1977, three kids--teenagers--were driving home on a backroad, farm street, in dover, massachusetts. listening to music too loud, yelling to talk over the music, and who knows what else, they were having a good time. at some point, the driver, bill bartlett, 17, spotted something at the side of the road ahead climbing over a stone wall. not slowing down, and not a little stunned, bill kept driving rather than break up his buddies' conversation, his mind trying to process what he'd seen. 'cause he'd never seen anything like it before. he pulled to the side of the road about a mile away and asked his friends if they'd seen it too. he described for them a small, pale creature with, seemingly, the body of a baby, with a large melon-shaped head and long prehensile fingers and toes--like a treefrogs. they hadn't and at first thought he was kidding until they really got a look at his face and saw that he was genuinely shaken. they drove back to check it out but what bill had seen was gone. and his growing uneasiness was contagious. about two hours later, 15 year old john baxter was walking home--in the dark--from his girlfriend's house on a road that runs sort of parallel to farm street, when he saw a figure walking toward him about 40 yards away. in the dark he couldn't make it out, but was fairly certain that it was a friend of his--or WANTED it to be--and so called out to him hoping for a friendly response. the figure just stopped. as john moved closer, the figure, now he could see that it was much smaller than he'd originally thought, turned and headed into the woods. john followed, thinking that maybe this was a little kid, or even...at one point, a monkey? (funny what your mind will try to convince you of when you don't have reference for something...else...) he even went into the woods after it, chasing it, for a few minutes--and then finally, he got spooked. and was terrified all the rest of the way home. the next night, a young couple, will taintor, 18, and abby brabham, 15, were driving home on springdale avenue when they spied the creature squatting next to a bridge railing, caught in the headlights, watching them as the car drove by. both were transfixed. a little farther up the road, will broke the trance when he asked abby if she'd seen that. she said yes and for him to lock the doors. so they go to school (the ones that still go to school) the next day and, though this is a small town and everybody knows everybody, they're not friends, they don't talk to each other, don't really know each other. (being from a small town myself, it's easy for me to buy this; you 'see' people everyday, but that doesn't mean you've ever talked with them or whatever.) 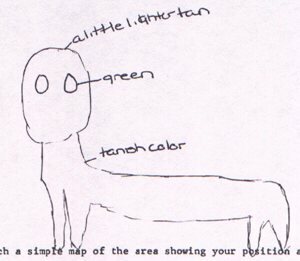 of course, they're telling their friends about this weird thing they saw out on the farm road and, of course, each of them draws a sketch of what this bizarre creature looked like. it's a cop who is investigating the strange reports who puts all the sketches--and eventually, the kids-- together and realizes that all the sketches are very very similar. in taking their statements, the authorities are careful not to let the kids have time to speak with each other and compare or corroborate stories. teachers and parents and whoever all give testimony that none of these kids are tricksters--good kids, a couple of 'em maybe a little wild at times, but they just don't have that in 'em. 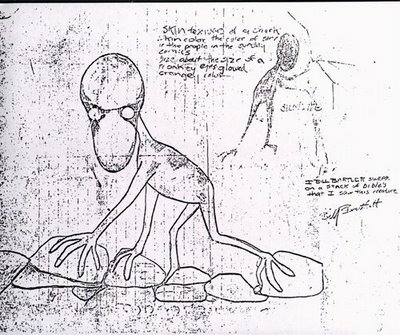 there are polygraph tests and investigations by cryptozoologists john keel (the mothman prophecies) and loren coleman, coleman dubbing the creature "the dover demon". 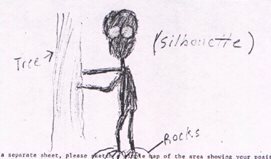 when it all came together, other reports of strange sights and occurances along the creature's apparent "route" came in; dogs barking, possible (peripheral) sightings, etc. here are bill bartlett, john baxter, and abby brabham's sketches. Spooky and on my birthday no less. how about it dover people...? Ha! That kinda stuff worked well for Roswell and Salem, you're right, Dover should embrase it! That is a creepy story, I know I'd heard of the Dover Demon, but I don't think I'd ever actually heard the story... Thanks Todd!